We have been taught as shoppers and consumers that packages and bundles save us money. There is a certain economic logic that says that the more you buy, the more you save. Value is equated with long lists of benefits, features, services—the longer the list, the greater the value. But not necessarily with modern self-publishing. Before Amazon, before eBooks, before POD, before online self-service book marketing, publishing was indeed a more complicated endeavor. Securing an ISBN, preparing printable files and making a book available for sale took experience, expertise, and required an investment. Now anyone handy with Word can publish a paperback and Kindle eBook on Amazon for free. Nothing illustrates the rise of self-service self-publishing better than looking at how many ISBNs are used for self-publishing. In 2007, CreateSpace used 6% of the ISBNs used for self-published books. The next 10 largest self-publishing services companies, often called vanity or subsidy presses, used 48%. In 2013, the last year numbers were reported, CreateSpace used 62% of those ISBNs. The total used by the next 10 largest skidded to 23%, a more than 50% decrease. As you can see, it’s obviously getting easier, not harder, to self-publish. There is nothing inherently wrong with paying someone to help you do it yourself. We routinely pay for pizza delivery, valet parking, shoe shines and scores of other services we could easily do ourselves. Our time has value and as long as we know the trade-offs, we can easily make an informed decision. The problem in self-publishing is that most authors don’t publish frequently enough to keep up with what may be free, or cheap, or easy to do on their own. Without reference points, you can easily be taken advantage of. Much of the process of self-publishing is project management so it does make sense to have an expert guide you through the process. But let’s be honest about costs and what is a truly unique service offering—services that in some cases you can get from many different sources. Let's take a look at some of the more common upsells, come-ons and “service offerings.” Then compare them to what you can get or do on your own, or via any other arrangement. Distribution. In my experience authors are enticed and focused on two things when it comes to making their book available for sale: They want their book on Amazon, and they want it in as many stores as possible. Vanity presses make a big deal about this by implying you need them to do this for you. Here’s a misleading graphic from one popular service. The items inside the red boxes are available for free via Amazon’s CreateSpace, or for a small fee from IngramSpark. Up until a few years ago, a self-publishing author had limited options for making their book available to the public. This is no longer the case. Today, anyone with a Word document can do the same thing claimed by several of these services—and for free. With few exceptions, distribution (for self-publishers) is a far more important consideration than who prints your book. CreateSpace and IngramSpark are popular because they make your book available to online bookstores, and for ordering by physical bookstores. Even CreateSpace uses Ingram (parent of IngramSpark) to distribute books to other bookstores. They call it Expanded Distribution. Creativity upgrades. This is akin to the idea that one buys creativity the way one buys sand or a pair of glasses. Need a little more? Spend a little more. Except creativity doesn’t work like that. A book cover designer or editor doesn’t have a hidden reserve of talent that can be dialed up or down for just a little more cash. Yet that is how packages are priced and presented. Take for example this Google search result for the term publishing “cover copy polish”, a package upgrade from these companies. By the way, all these companies are part of the same company, AuthorSolutions. Traditional publishers, such as Hay House, contract with AuthorSolutions to offer a private branded version of the AuthorSolutions services. My point is that publishing a book is an exercise in creativity. It doesn’t end with the manuscript. There are other creative contributions that must not be minimized or treated as a commodity, notably cover design and editing. Do not choose a package solely because it includes creative upgrades. Upsells, come-ons, and throw-in’s. This is where you really need to be careful because marketing expenses can quickly add-up. One of my clients paid a vanity press $13,795 and sold fewer than 20 books! Here are a few 7 other offerings you’ll find in those packages, and my comment on its value or alternatives. Social media training and guides: Just type these bolded words into Google for free information; you can also get professional online training. Check out a free 10-day trial to Lynda.com. You won't believe how many courses they offer for $25/month. Postcards, business cards, etc. : Available from lots of sources. Kirkus Review Packages: Buy direct from Kirkus. Putting your book into their online store. Think about it, how many readers do you know that shop for books at Lulu or Outskirts Press? I suppose you might sell a few books over the course of a few years but this is no reason to buy a package or sign with one of these companies. If you plan to send your readers someplace to buy your book, send them to your own website. You’ll make more money and capture an email address in the process. Extra copies of your books. While researching this article I got a popup from one of the vanity press websites offering 5 free books if I acted today. Five 5 books from CreateSpace or IngramSpark costs between $11 and $30, depending on the size of your book. A small incentive to justify a snap decision to spend a couple thousand dollars. A few years ago, we surveyed more than 300 self-publishers about their publishing experience. Their number 1 regret? Not thinking more about marketing before publishing their book. It is essential to find the right budget balance between producing the book, and marketing it. Producing a book should never be confused with selling a book. Evaluate options based on distribution reach, not book production values. Unless you are planning to do a traditional off-set print run of more than 1000 books, your printing options are greatly limited. All these companies do POD—print-on-demand—and the quality difference and options between them vary only slightly. Beware of creativity upgrades. If you get it anyway, be sure to get another opinion from someone you trust rather than assume what you get is the final word. Buy only what you need. Shop all marketing offers. Research the books from past clients and ask the company about them. Don’t assume the next level up will pay for itself with additional book sales, or a better-looking book. Ignore their online store and free copies of books. Those are not reasons enough to use that company. Lastly, a word about the often-misunderstood ISBN. Put simply: if someone gives you the ISBN as part of the publishing package, their name shows as the publisher. That’s not a big deal legally, and you may not care who the publisher is. But keep in mind that if you want to print or distribute the book with another company you’ll need to get a new ISBN. And if you have book reviews on Amazon, those won’t transfer to the new ISBN. Buy your own ISBN from the authorized seller, Bowker at MyIdentifiers.com (or a reseller like CreateSpace or IngramSpark). If you need further help, get my book, Register Your Book. I hope you found this helpful. 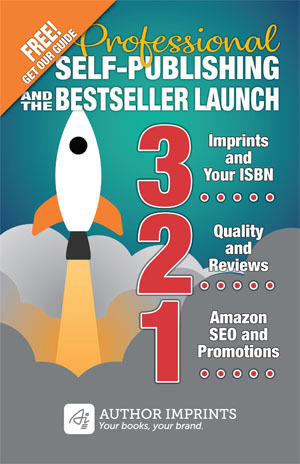 AuthorImprints was established to help authors publish independently. We do not offer packages—because every book and every author is different. We also insist that you protect your publishing investment by investing in your own ISBN. We do not sell them, but can help you buy one for as little as $89. A small price to pay for long-term peace of mind. Need a quote, or want to discuss your project? Please contact us. It is insight and advice like this that is why I am looking forward to setting up my imprint (likely two of them, actually) and producing my books with you. I have been seeing some writer friends make basic mistakes in over relying on Amazon and their CreateSpace division, surrendering perhaps half the market potential (and earnings) on their books. Thank you for already saving me from making such tempting but wrong mistakes. As publishing continues to evolve, fast, it’s about protecting your investments and keeping options open. Thanks for stopping by, Loren. I’m not sure I understand your question. I’ve never heard of a minimum requirement for book publishing. One is it.